Summer 2019: Data Science Summer School in Paris (Jun), European Meeting of Statisticians (Jul), SIAM Conference on Applied Algebraic Geometry (Jul). Feb 2019: I was awarded the RSS Guy Medal in Bronze and could not feel more honored. Many thanks to all my wonderful collaborators. Causality tries to answer how we can improve systems by performing interventions. It may also help us to build robust models that can still be used if the system changes. It is an exciting and important research field. I feel that the award recognises that. January 2019: Starting as an AE for Annals of Statistics and Journal of the American Statistical Association. July 2018: Our book	was awarded the ASA causality in statistics education award. We feel greatly honored! June 2018: Wow!! I was awarded a teaching prize from the SCIENCE faculty and could not be happier about this. Thanks to all the students and to all people involved in the teaching. Keywords: causality, computational statistics, machine learning, robustness, independence testing. 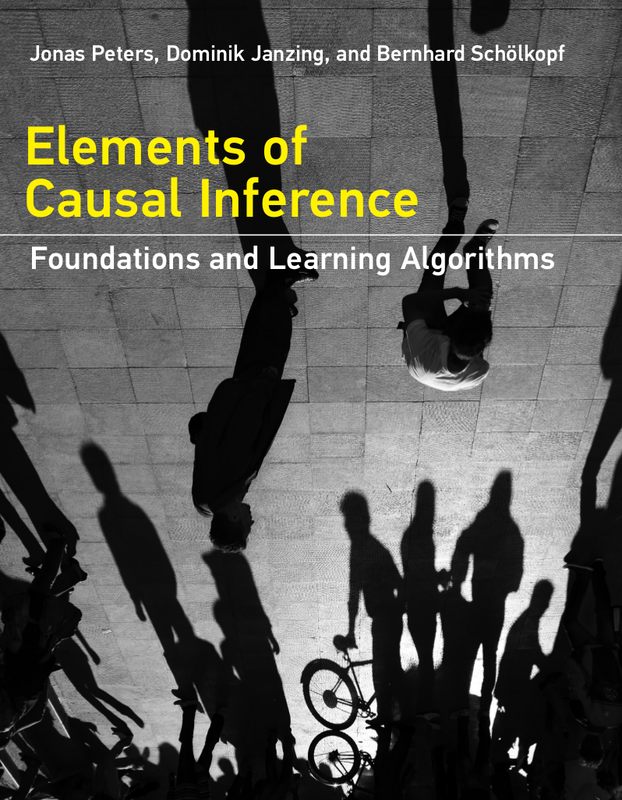 My work focuses mainly on causal inference: we try to learn causal structures either from purely observational data or from a combination of observational and interventional data. We therefore develop both theory and methodology. Our work relates to areas like high-dimensional statistics, computational statistics or graphical models. It's an exciting research area with lots of open questions! Most of the publications are also on Google Scholar. Even, if there is no PhD call and you think about doing a PhD or postdoc in causality, please send me an email. We have written a book on causality that has appeared as open access at MIT Press. In July 2018, it was awarded the ASA causality in statistics education award. The pdf can be downloaded for free from the MIT Press website (look for "This is an open access title" on the left-hand side). 'Book recommendation: David MacKay: Information Theory, Inference, and Learning Algorithms', Link to pdf, 2019. 'My research' Link to pdf, 2019. 'Nachgefragt', published in Deutsche Universitaetszeitung, 2019. Link to pdf. 'Die haben Kuehe, aber keine Insekten gegessen? ', published in Calender of the Young Academy 2020. Link to pdf. 'Ich frag' ja nur', calendar of the Young Academy 2019 (Thorbecke Verlag) about open scientific questions. Published together with Miriam Akkermann, Ulrike Endesfelder. Order here. Discussion in 'Forschung und Lehre'. 'Die Vermessung unserer Persoenlichkeit', published in Junge Akademie Magazin, Heft 24, September 2017. English. 'Can chocolate make you smart? ', published in Junge Akademie Magazin, Heft 23, Februar 2017. English. German. Jonas is associate professor at the Department of Mathematical Sciences at the University of Copenhagen, and is a member of the Junge Akademie. 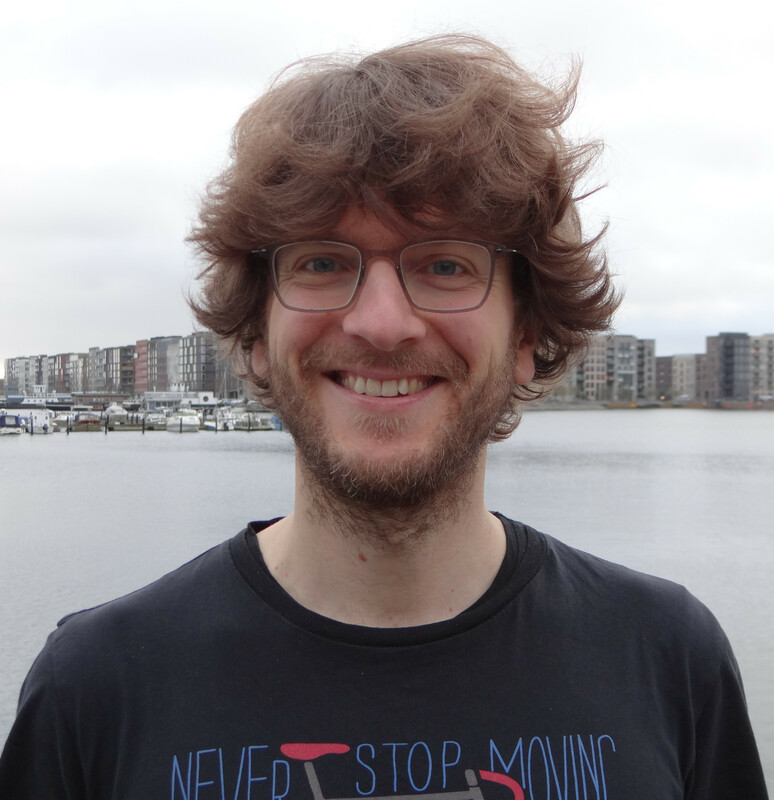 Previously, Jonas has been leading the causality group at the MPI for Intelligent Systems in Tübingen	and was a Marie Curie fellow at the Seminar für Statistik, ETH Zurich. He studied Mathematics at the University of Heidelberg and the University of Cambridge and did his PhD with Dominik Janzing, Bernhard Schölkopf and Peter Bühlmann. Jonas has done research internships with Leon Bottou at Microsoft Research (WA, USA), Martin Wainwright at UC Berkeley (CA, USA) and Peter Spirtes at CMU (Pittsburgh, USA). Jonas is interested in inferring causal relationships from observational data and works both on theory and methodology. His work relates to areas as computational statistics, graphical models, independence testing or high-dimensional statistics. 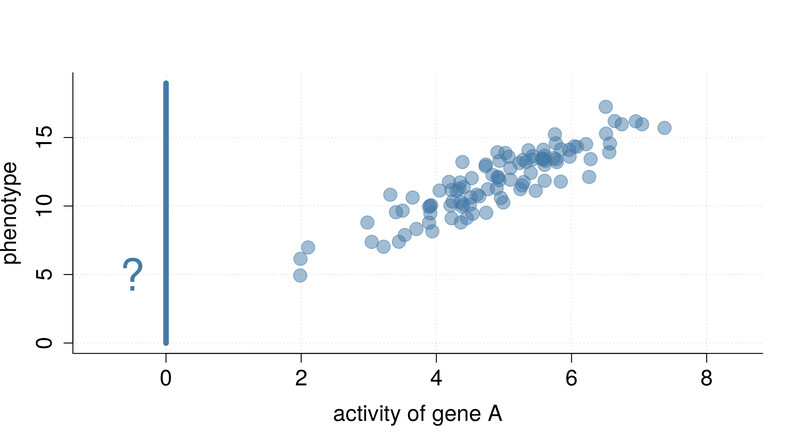 Consider the following problem: we are given data from gene A (or B) and a phenotype. Clearly, both variables are correlated. 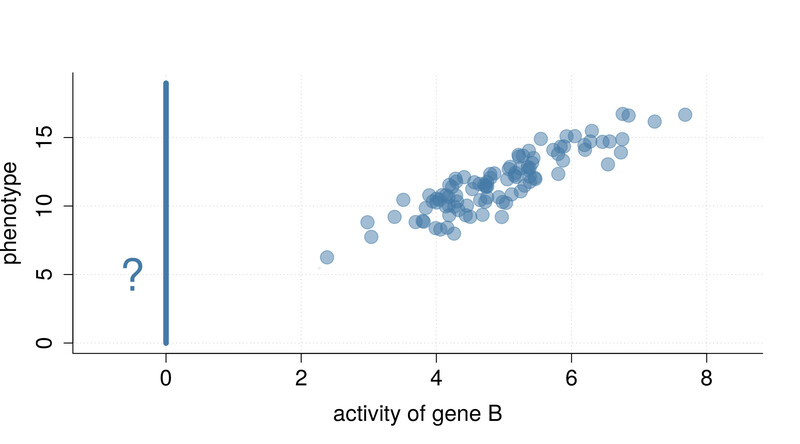 What is the best prediction for the phenotype given we are deleting gene A (or B), such that its activity becomes zero? But then, if we do not accept any form of causal notion, we cannot distinguish between these two cases and our best prediction must be: "I do not know."! 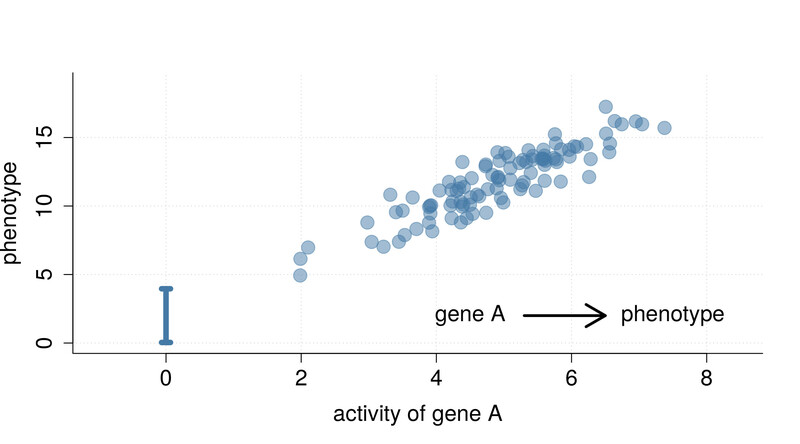 Causal Model: If we want to be able to describe the above situation properly, we need a so-called causal model that (1) models observational data and (2) interventional data (e.g., the distribution that arises after the gene deletion) and that (3) outputs a graph. Functional Causal Models (also called Structural Equation Models) are one class of such models, see the figure on the right. If you are interested in more details, see the script below, for example. Examples of questions that are studied in this field: How can one compute intervention distributions from the graph and the observational distribution efficiently? What if some of the variables are unobserved? 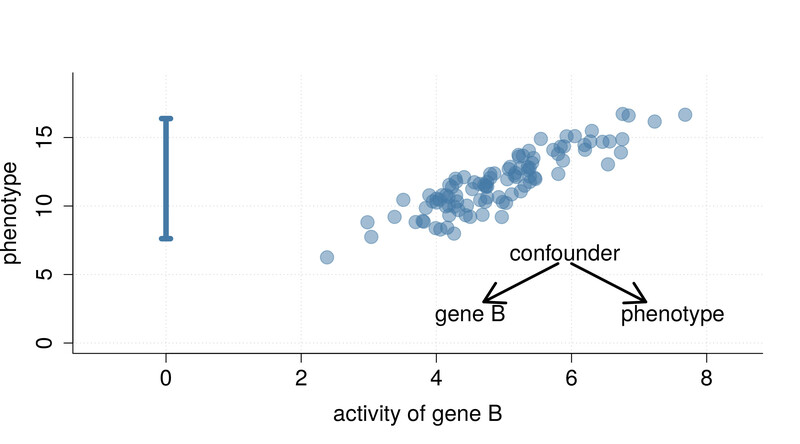 What are nice graphical representations? Under which assumptions can we reconstruct the causal model from the observational distribution ("causal discovery")? What if we are also given data from some of the intervention distributions? Does causal knowledge help in more "classical" tasks in machine learning and statistics? I have written a script on causality that I am more than happy to receive feedback on. Please note that it is still missing some sections. It can be downloaded here.